The specialization in fine art focuses on providing students with a unique exposure to the expanding world of art and visual culture. 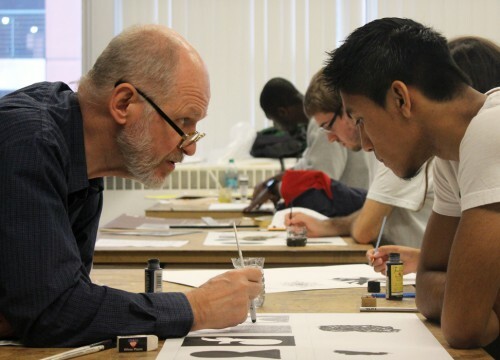 This specialization offers a curriculum in painting, drawing, printmaking, photography, sculpture, and digital arts. 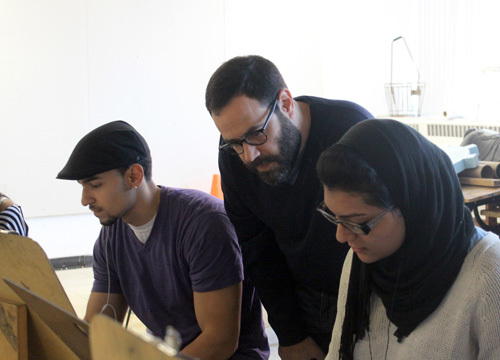 Through an integrative approach, students can combine advanced courses in these areas to develop varied applications of innovative methods and materials. Courses in critical studies and advanced art history provide the student with a social, cultural, historical, and philosophical context for understanding traditional and contemporary art. These acquired skills add to the development of their personal expression and cultural literacy. Ultimately, students learn about the relationship of their art to the exhibition space while they prepare a thematic body of work for final viewing and critical assessment. Fine art students complete a portfolio and special capstone project that is exhibited in the campus gallery in their senior year. This exhibition helps build a portfolio for job placement and/or admission to graduate school. In addition, students have the opportunity to develop independent work with faculty and to apply for competitive internships on campus and within the metropolitan area. The specialization in fine art is offered through the Department of Arts, Culture, and Media (ACM). ACM houses programs and/or majors in fine arts, graphic design, art history, media studies (with majors in journalism and video production), music, and theater. Each major includes an ACM core sequence requirement. Taking advantage of the range of disciplines in ACM and the campus mission to engage with its community, the core combines an integrated sequence of classes, shaped in large part by projects drawn from the urban region surrounding the university. The sequence consists of three classes: Introduction to Arts, Media, and Culture, a class designated by each program that combines interdisciplinary pedagogy with a student’s major; and either Colloquium in Arts, Culture, and Media or Seminar in Arts, Culture, and Media.